Andy, my boyfriend, is a golf-aholic...he manages a golf store, he plays golf (and is trying to go pro), his idol is Tiger Woods, and he drives a VW Bug that is painted to look like a golf ball with a big red tee on the top of it. Ok, stop laughing! He's also not a very "well-balanced meal" type of guy. His daily eating routine is a Mountain Dew and a bowl of Fruity Pebbles for breakfast, two Mountain Dews for a snack, a Whopper Value Meal from Burger King (with a large Sprite) for lunch, a Mountain Dew and Tiger-ade (Tiger's Gatorade) for an afternoon snack, a healthy dinner prepared by me with a Mountain Dew, and ice cream with five Oreos, 1/2 a bag of Sour Patch Kids and a Coke for dessert. Then he stays up until 2 in the morning and will have some scrambled eggs and cereal for a midnight snack! Surprisingly, and frustratingly, he doesn't gain a pound! He is a little stick figure, which is totally not fair...but that's a whole other story. So, when he told me that he was playing in a golf tourney this weekend I decided that I would make him a healthy, filling, portable snack for him to take to the course. The first thing that popped into mind was scones, especially since he was teeing off at 7:30 am. Scones are also easy to transport in a golf bag, unlike big muffins. 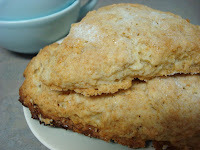 My Honey Oatmeal Scones would be sure to give him the boost that he needed, and would also last in his tummy for a few hours, thanks to the hearty oatmeal. When he called me to tell me that he had made it on to the next round I secretly told myself that it was due in part to my special good luck gift! Hey I have to get credit somehow!! Preheat oven to 400 degrees F, line baking sheet with parchment paper. Stir eggs, buttermilk and honey together, set aside. Whisk flour, oats, sugar, baking powder, baking soda, salt and nutmeg together in a large bowl. Drop in the butter and working with your fingertips rub the butter into the dry ingredients until the mixture is pebbly. Pour the egg mixture over the dry ingredients and stir with fork until the dough just starts to come together, it'll be sticky so don't get scared, and don't over work the dough. Still in the bowl gently turn it with a rubber spatula 8 to 10 times. 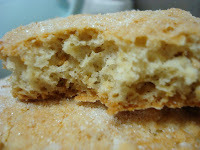 Turn the dough onto a lightly floured work surface and divide it in half. Working with one half at a time pat the dough into a rough circle that's about 5 inches in diameter, cut into 6 wedges and place on the baking sheet, sprinkle lightly with remaining sugar. Bake for 20 to 22 minutes, or until their tops are golden brown. Cool for 10 minutes before serving, and serve plain or with jam, honey, peanut butter, yada-yada! Nice to meet you, look at your blog sympathy. And links to your blog please. 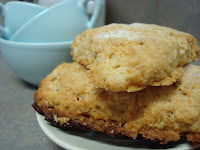 Sounds like your scones are Andy's good luck charm! They look absolutely delicious. those are so cute...positive energy scones! My hubby eats like that and never gains an ounce. Frustrating! Seems like your beautiful scones will be his ticket to success! Good Luck!